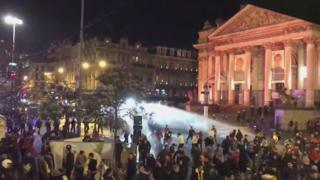 More than 20 police officers were injured in Brussels when celebrations over Morocco's qualification for football's World Cup turned violent. The Moroccan national side qualified for the 2018 tournament in Russia with a 2-0 victory away to Ivory Coast on Saturday, topping their group. Belgium has a large Moroccan community and fans hit the capital's streets after the game. Damage included a burnt car, smashed glass and looted shops, police said. One witness posted video to Twitter of water cannon being used on a crowd. Police said it was used on a group of about 300 people, some of whom were throwing stones. Calm had returned by 21:30 local time (20:30 GMT), a reporter for the AFP news agency said. Belgium's Interior Minister Jan Jambon condemned the riots, tweeting (in French) that they constituted "unacceptable aggression in the centre of Brussels". He added: "Living together means respect, also for the police who are committed to our safety day and night." In the Netherlands too, large groups of fans from Morocco or of Moroccan background celebrated in the streets. Some celebrations there turned violent, with the police in The Hague tweeting (in Dutch) that some people threw things at officers. In Rotterdam, dancing fans set off flares in red and green, Morocco's colours. Meanwhile in Morocco itself thousands of fans celebrated in the streets of Marrakesh, Casablanca and other cities.